Toronto’s source for large sizes, wide and hard-to-fit feet. Ladies and men’s footwear, sandals to boots, fine leather products. 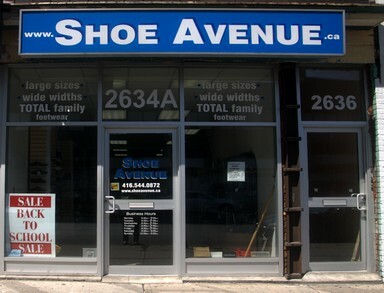 Shoe Avenue is a family-owned independent shoe store with 25 years’ experience in providing friendly, personal service. At Shoe Avenue you’ll find a variety of casual and dressy styles in your favourite brands, including Florsheim, Propét, Brooks, Dr. Martens, Hush Puppies, Trotters, Cougars, Foamtreads and more. And our selection of Tana shoe care products will keep your purchases looking great.